A complete sensory experience. The color of this beer suggests something completely different from the actual taste. It's very golden, not unlike your average mega-beer, but with a much stronger head. But the smells that emanate from that golden liquid are simply heavenly. I got a huge crisp apple cider whiff on my first smell, and there's definitely a large fruit presence to go with some subtle hops. It smells delicious and interesting, and if it's possible for a beer to smell refreshing, this one does. The first shocker in the taste is how dry this beer is. It's almost like drinking a dry champagne. Heavy fruit flavor, but with the sparkling cling of champagne. Really easy to swish around your mouth and swallow, and seeing that I prefer dryness to sweetness, it fit my needs perfectly. This beer has it all, down even to its presentation. Its uniquely-shaped bottle is appealing, and if served correctly in an Orval tulip glass, it's a can't miss. 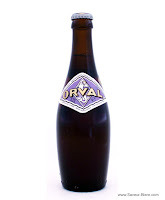 Orval will quench and refresh you, give you enough alcohol presence at the back to satisfy those needs, and won't bog you down or take you two hours to finish. You probably will want to make it last that long, though. This is a fascinating list--I enjoyed reading it, and it has inspired me to make my own list. My biggest caveat is that in living on the West Coast I can't get some of these beers--would love to try the Bell's Hopslam and Tyreana. You should send me some bottles. Actually, the last few over-the-top hops I've had in bottles have been skunked--ugg, and now I religiously check born on dates. Just send me the cans. My top ten will come in the next comment. i have a few saved for you. i can't find the tyranena one i loved so much in bottles but do have a different one and have a few others in mind for you. do you branch out into the stout world much? i did have a few brilliant ones recently. trying to convince kristie to make a visit to CA, mostly so i can get my hands on some russian river, stone, lost abbey, etc...have you had samichlaus? i picked up a few bottles of it in the week or two they were in stores here.